Last week I made Easy Puff Pastry and I have been busy ever since creating recipes with puff pastry. These puff pastry pinwheels were my first recipe. 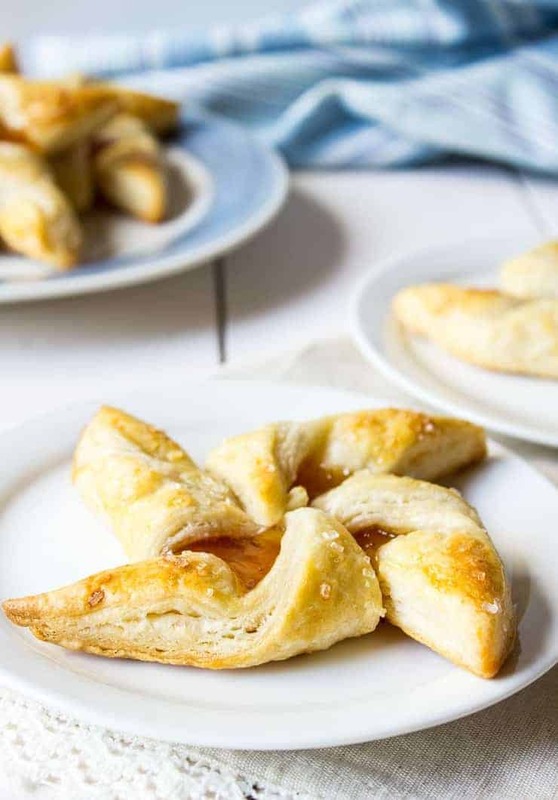 This puff pastry pinwheel recipe is super easy and super delicious. 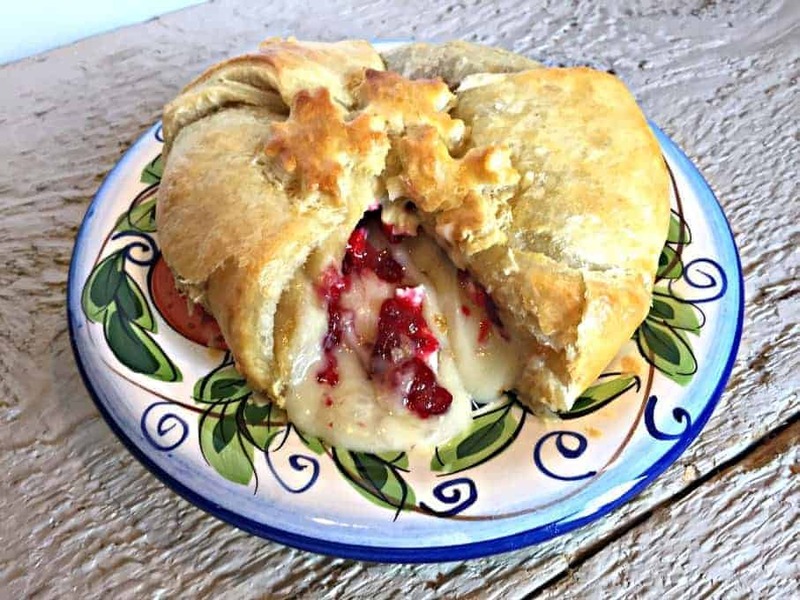 All you need is puff pastry – make your own or buy from the store – and jam. 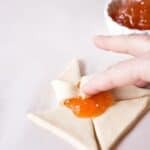 I used apricot jam, but you could easily use any jam that you love! Cut out 4 inch squares of puff pastry. Place a dot of jam in the center. Cut a slice in each corner and fold up one corner on each triangle piece. Brush with an egg wash and sprinkle with sugar. 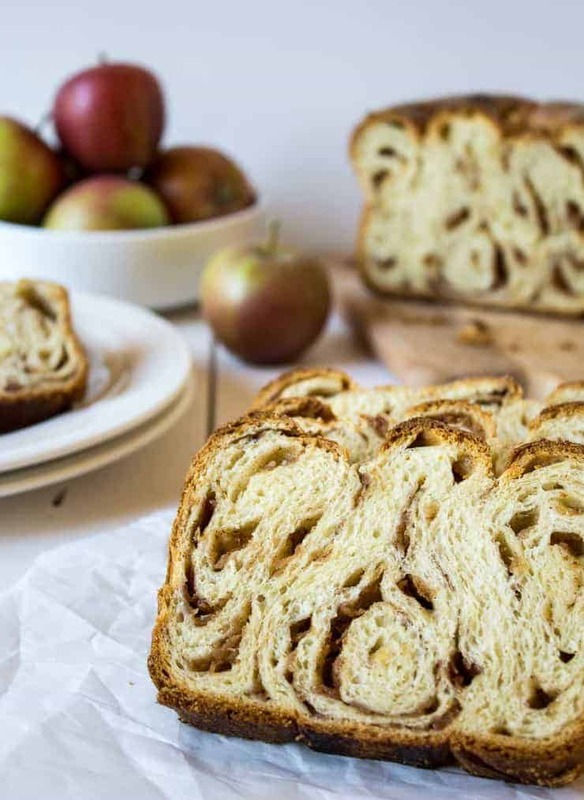 Bake – and the end result is amazing! Delicious, buttery, flaky layers with a sweet filling! 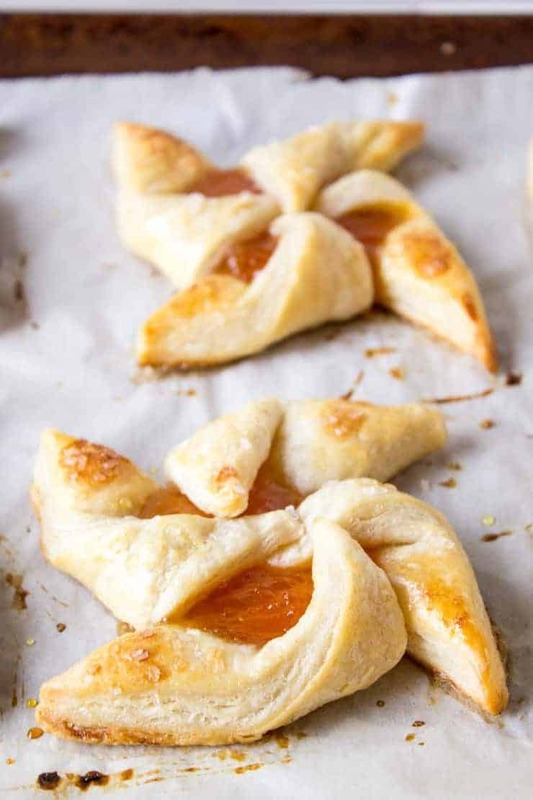 When I made these pinwheels, I used an entire batch of my homemade easy puff pastry. 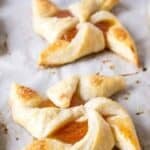 I made eight jam pinwheel pastries. 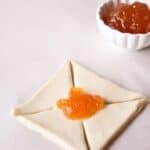 If you are using a purchased puff pastry, you will need to use both sheets of pastry. 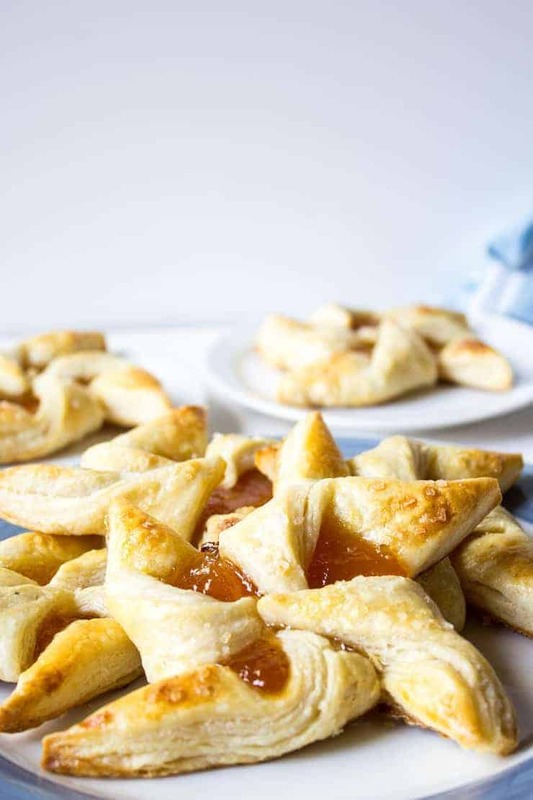 Delicate pastry made with puff pastry and filled with jam. 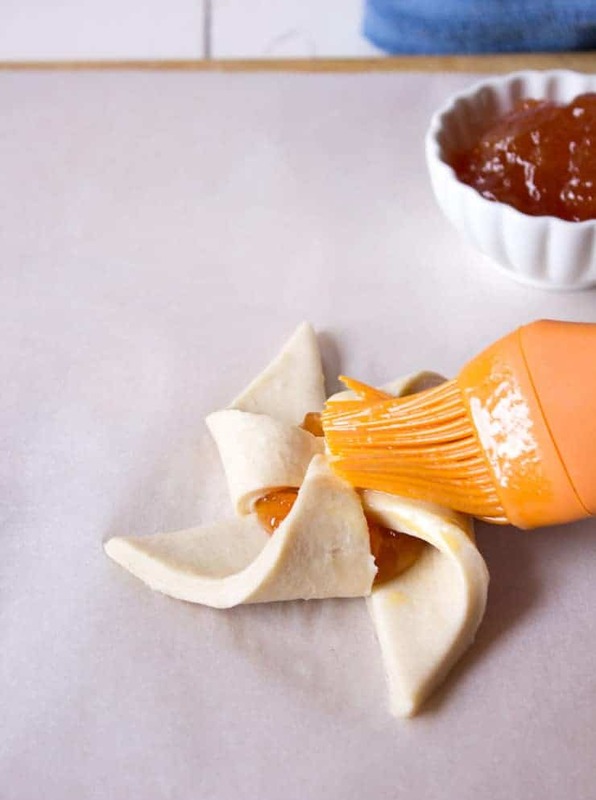 Roll out pastry dough. If using homemade dough, roll to 8" X 16". If using store bought dough, use both sheets. Roll each out slightly larger than original size. Move each square to a parchment lined baking sheet. 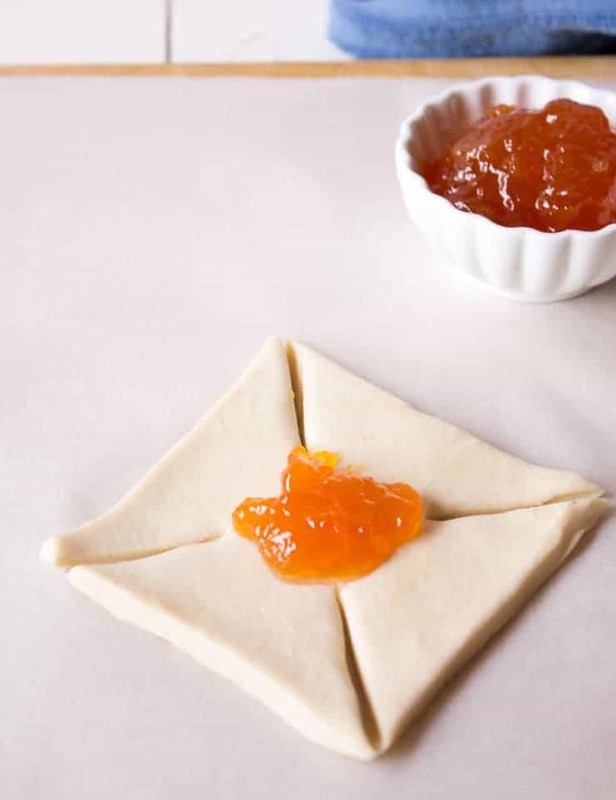 Place 1-2 teaspoons of jam in center of each square. Make slits on the corners of each square. Fold one corner of each triangle piece towards the center. Press down firmly. Repeat with remaining corners. Mix egg and water together in a bowl. Brush egg wash across entire surface of pastry. 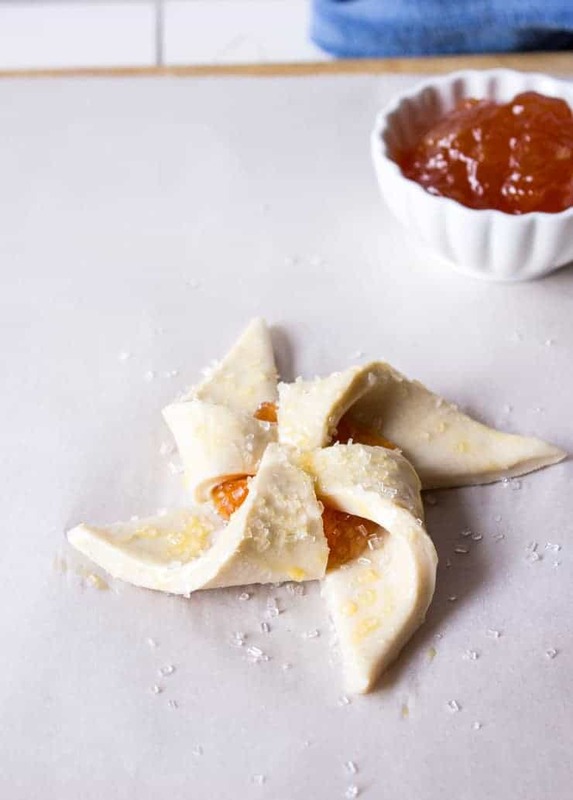 Use your favorite jam as a filling. 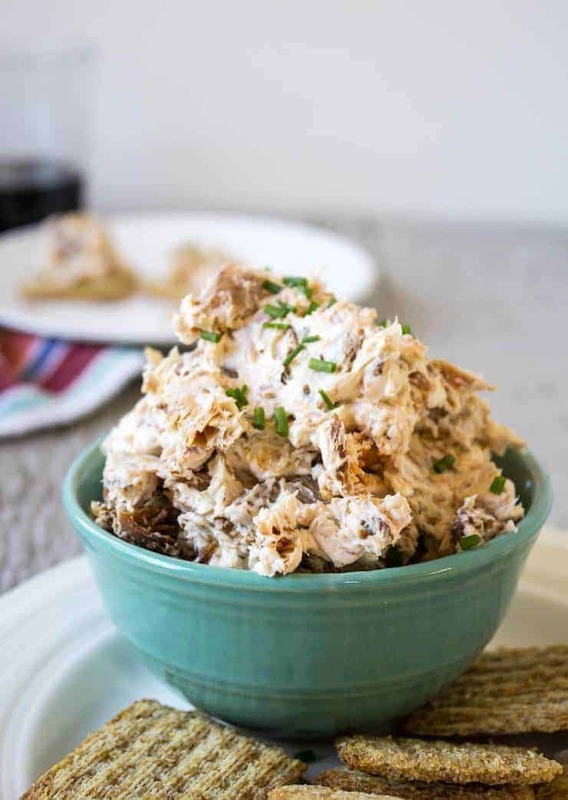 Recipe inspired by Williams Sonoma Baking Cookbook. Pinwheels remind me of my childhood. I could seriously eat 5 of these and not blink. Apricot is a nice flavor and that sprinkling of sugar gets me every time. Take care. Thanks, Miriam! We loved them and they disappeared quickly. These pinwheels are just too darn pretty! And I love that you used apricot jam – it’s a favorite of mine!! I totally agree! 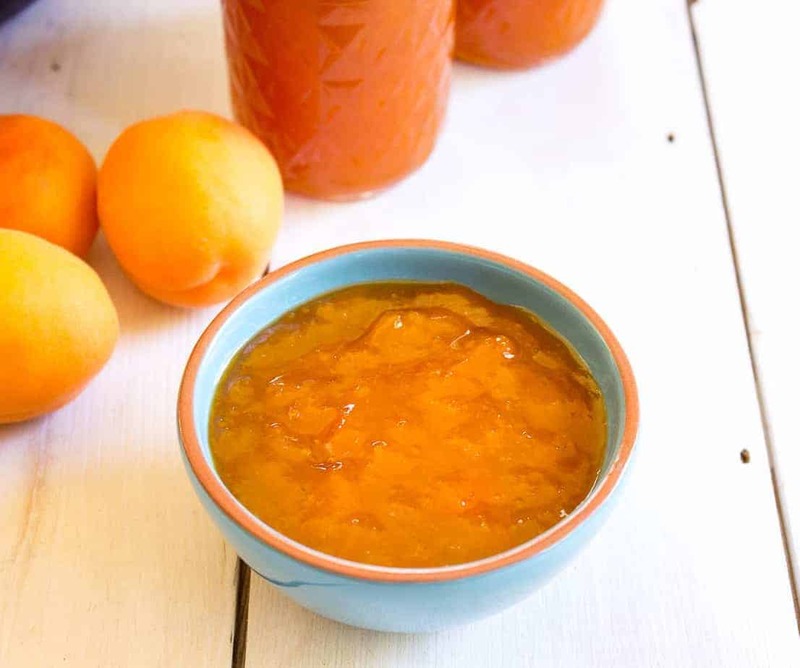 I love apricot jam in just about everything! You little kitchen ninja you! I would love to have one or twelve of these thrown, ninja-style, right into my face. 🙂 They’re so pretty and cute! Kitchen Ninja! 🙂 I love it! 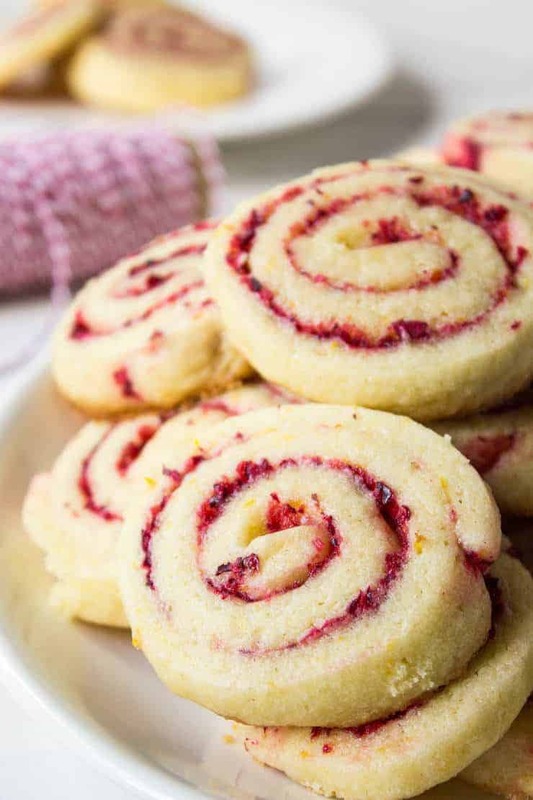 Pinwheel cookies are one of my favorite cookies to make because they always look so pretty Kathy! 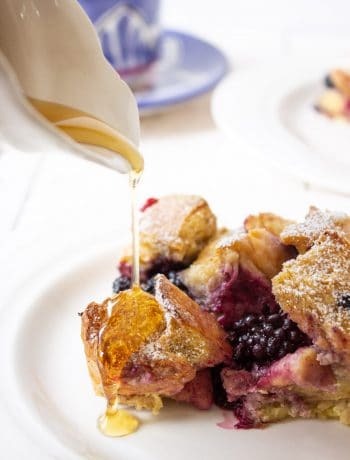 And you’ve gone above and beyond with homemade puff pastry! Well done my friend!! These would be a hit at our house! We all love jam filled cookies! It’s so impressive that you made your own puff pastry! These pinwheels are beautiful! Puff pastry anything is dangerous around me, because if left alone, I’ll eat it ALL! These pinwheel are super cute, Kathy!! Perfect dessert for the holidays!! Cheers! Such a beautiful dessert and what a great use of puff pastry 🙂 Love how easy they are too! What a gorgeous little treat, Kathy! I love creating desserts with fun shapes…not only are they fun to eat, but they often create fun conversation, too. 🙂 And it just so happens that I have some leftover apricot jam from another recipe. 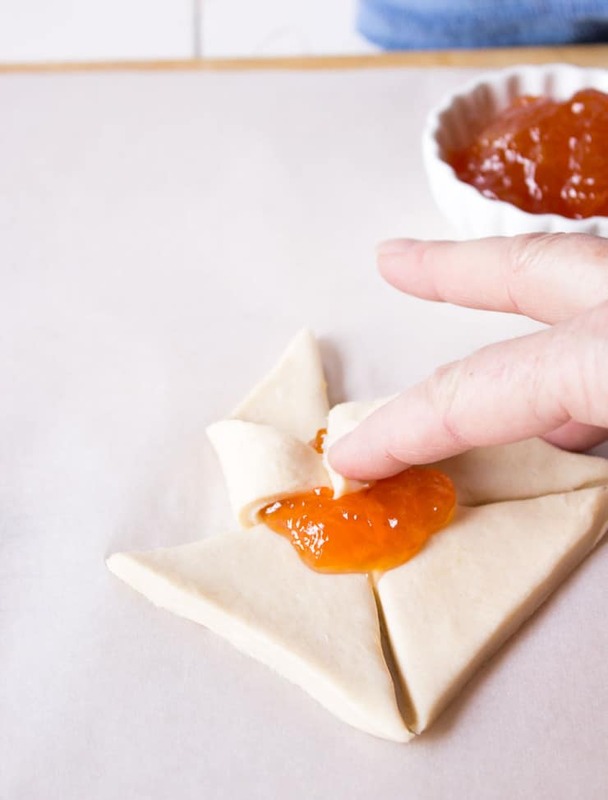 We’ve been making PB & Apricot sandwiches for Robbie lately, but I need to rescue some of that jam for these pinwheels now! Delicious! !